The night of the 29th broke all my garden records - I am on C130 sp. with a few still to determine. 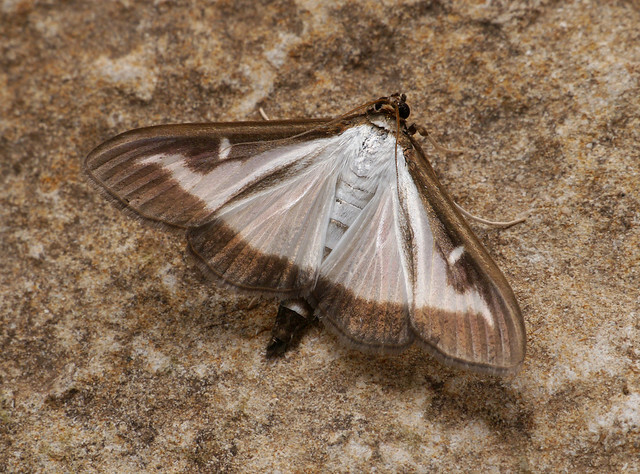 The main excitement was this fine moth - 1409a Cydalima perspectalis - the Asian Box Worm moth. A shame it is such a pest of Box trees. New to Britain in 2008 but it is now turning up more regularly. Mine is, I think, the 4th for Gloucestershire. It has not yet been seen in Worcestershire. It's been an amazing few days Oliver. Tomorrow night seems to be deteriorating each time I check on the BBC weather. Perspectalis appeared in Bucks in 2010 - 8 records since then and although they are all in the south of the county, two that I was involved with were caught well away from Box. And as I don't have any Box, I hope it thrives. A great-looking moth, Peter, but I'm not sure it'll turn out to be good news in the end.